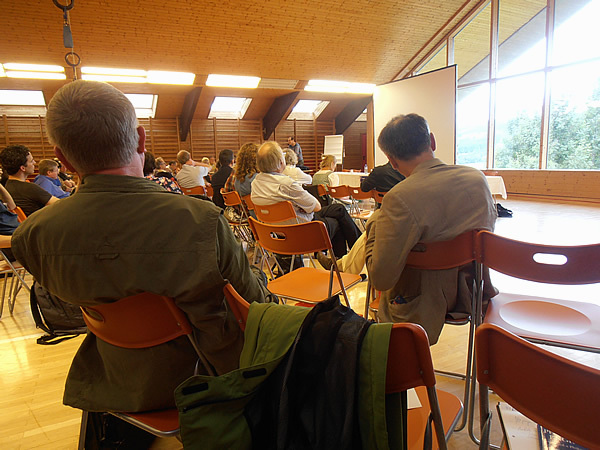 The 37th International Wittgenstein Symposium took place from 10 – 16 August 2014 in Kirchberg/Wechsel, Austria. 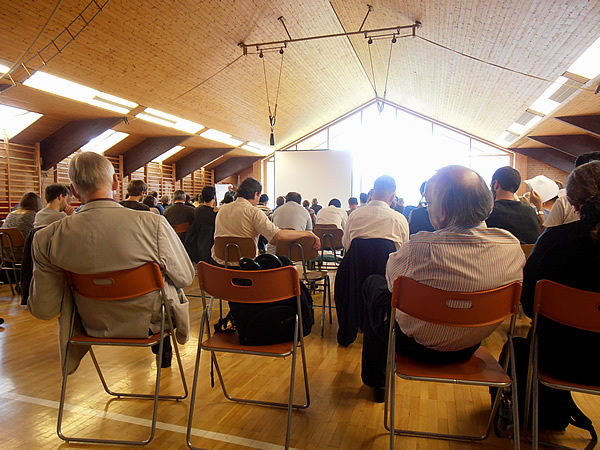 The general topic of the Symposium was “Analytical and Continental Philosophy: Methods and Perspectives”. To my surprise, many phenomenologists were present. I had the impression that they come “out of their holes” as soon as the topic of a conference somewhat allows for their participation. Phenomenology still seems to exert a strong attraction on many philosophers. In some talks a reconciliation between Analytic and Continental Philosophy was proposed. I thought that the role of the “peace dove” surely provokes the impression in the audience that the speaker possesses a mild, wise and experienced character. The desire to create this impression may be present especially in philosophers who are already professors and are situated (firmly) in the philosophy departments of their universities. These philosophers do not need to achieve anything anymore, therefore they can present themselves exhibiting a generous attitude. A preferred way to perform the reconciliation between Analytic and Continental Philosophy consisted in claiming that, in reality, there is just “good” and “bad philosophy”. Good philosophy is characterized by linguistic “clarity”, whereas bad philosophy is “cloudy” and incomprehensible. This differentiation between good and bad philosophy seemed to echo the difference between scientific and unscientific philosophy, where the former one is, of course, the good one whereas the latter one is to be detested. 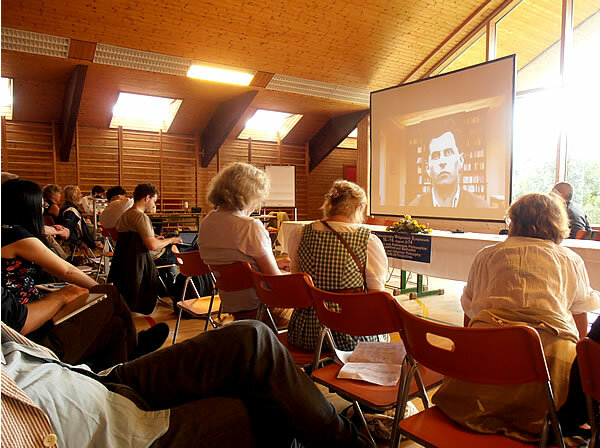 During this year’s Wittgenstein Symposium there were more hints than usually pointing to the fact that Ludwig Wittgenstein’s adscription to the analytic tradition of philosophy is not so clear that it can be taken for granted. The later Wittgenstein might be conceived as a phenomenologist for studying the use of words in everyday situations. But also the younger Wittgenstein already delimited the project of Analytic Philosophy in the ‘Tractactus’ by claiming that we have to be silent about that about what we are not able to speak. To resume this idea about Wittgenstein: It seems that there was a sceptic attitude in Ludwig Wittgenstein which caused him to maintain a modest opinion concerning the possibilities and limits of philosophical inquiry. This modesty contrasted with the epistemic optimism of the project of Analytic Philosophy; and it was also this sceptic attitude or epistemic modesty that induced Wittgenstein to undertake studies of everyday life whose purpose does not consist in adding new findings to scientific knowledge. The idea here is that, in last resort, it was Wittgenstein’s sceptic attitude towards knowledge that made him to be kind of a phenomenologist whereas the optimism of the analytic philosophers to solve all epistemic problems was what inclined them towards science. In the ‘Tractatus’ Wittgenstein explicitly declared philosophy to be an “activity” and not to be “a science”. 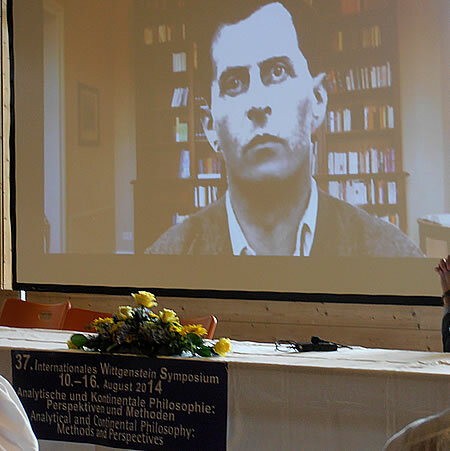 All these impressions and thoughts about the 37th International Wittgenstein Symposium are, of course, my personal ones, and not the official outcome of the symposium. As I am not so confident about the possibility of reconciliation between Analytic and Continental Philosophy, in my talk “Is the Getter Problem Caused by the Epistemic Passions of Analytical Philosophers?” I proposed an additional differentiation, namely that between academic or scientific philosophy versus unscientific or practical philosophy. For my purpose I defined unscientific philosophy as that kind of philosophy that tries to answer questions of human beings whereas scientific philosophy is busy with projects like establishing the “foundation of epistemology” and the like which represent the questions of fields of enquiry or those of academic subjects, but not those of human beings. In short, science considers itself to be a very important project, so important that the questions of real human beings usually seem to be lacking the dignity to be answered by science. This may look like a “polemic” definition of science. Actually, it is not meant to be polemic. It is rather my everyday experience when reading scientific and academic texts. It represents a scientific mindset which, in my opinion, cannot be reconciled with that one of a practical or phenomenological philosopher. I think those two kinds of philosophers are even unable to understand each other. This is because they embrace differing concepts of philosophy, and they are searching for different things in philosophy. Therefore, when talking to each other, they are usually talking past each other. The Gettier problem served me as an example for a typical scientific or academic problem. In my talk I especially worked out the loss of personhood in the setup of the Gettier problem. I said that it is no coincidence that in the Edmund Gettier’s first counterexample against the so called Standard Analysis of Knowledge the subject of knowledge is presented to us as somebody who needs to get a job but inspite of that concentrates on the number of coins in the pockets of his competitor in the job interview. From an objective point of view a job is not more important than the number of coins in somebody else’s pockets. They are both just facts in the world possessing truth values that can be ticked ‘yes’ or ‘no’, ‘true’ or ‘untrue’. The loss of knowledge as personal knowledge is prepared by defining knowledge as propositional knowledge. Propositional knowledge means that there is a concept of knowledge that claims that a person is able to know a proposition, that is: a sentence, alone and that she is able to know any proposition. Propositional knowledge separates of the knowledge of a specific proposition from the rest of the knowledge a person possesses, it separates the knowledge of that proposition from what the person needs to know and from her interests, and it separates that piece of knowledge from its significance for the subject of knowledge and from its social significance. By cutting knowledge into pieces the subject of knowledge as a person is also cut into pieces. But analytic philosophers are not aware of that fact. They continue to think that it is still a person, in Gettier’s counterexample a person called Smith, who knows that his competitor Jones has ten coins in his pocket. They continue to perceive the subject of knowledge as being a person while they have reduced knowledge to being a piece of information that can be saved on a computer hard disk. It is a real concern of me to explain why science provides us with a lot of (true, and therefore valuable) knowledge about reality but not with any orientation in the world, and I consider that what I showed in my talk at the 37th International Wittgenstein Symposium to be an important philosophical finding; a finding that can possibly answer the intriguing and seemingly paradox question: Why is it that exactly the epistemic project that was invented and is undertaken in order to provide us with knowledge – science – does not provide us with knowledge insofar as we are persons or individuals? The answer is that this is so because the epistemic subject in science is neither a person nor a human individual. The epistemic subject of science is an abstraction; that means that it was reduced by a process of theoretical abstraction. It was reduced to a being that has no special interest in anything, and, therefore, considers all possible objects of knowledge to be of the same relevance. In this context it is also interesting that in the second Gettier counterexample, the logical inference Smith draws neither helps him to find out where his friend Brown is, nor to make sure that his other friend Jones owns a ford. It can be shown that in Gettier examples the subjects of knowledge do not gain anything when they gain knowledge. Furthermore, in the same context it is also interesting that in Gettier examples like Gettier’s own counterexamples or Chisholm’s “Sheep-in-the-field”-example, the proposition that allegedly is the justified true belief of the subject of knowledge is understood literally whereas it is quite clear from the description of the situation that the literal meaning of theses propositions is not what the person meant to say. Utilizing Gettier examples, it can also be shown that analytic philosophers do not care about what people have in mind when they say something. Hence, how could they possibly care about people learning anything – any content learned by a person is also only something that she has in mind. Actually, the hypothesis of my talk was even stronger: Gettier examples show persons who do not know anymore what they need to know. For them everything is of the same interest. They have lost the contact to themselves. They are alienated. Smith has forgotten that he needs a job; he is distracted; his attention is caught by something completely unimportant, by the coins in the pocket of the other job applicant. This is why some forms of philosophizing (the Gettier problem is one of them) are to be considered not only as being theoretical in the sense that they are not offering a promise of utility to anybody in a direct form; they are rather actively distracting us from what we need to know. In other words, the Gettier problem belongs to an actively disorientating form of philosophizing. I concluded my talk by saying that the Gettier problem makes us silly. If we reflect about how such a paradoxical thing is possible we have to think about the role of social institutions in the process of knowledge creation. When a scientist is considered as being an alienated person for whom everything is of the same interest, it is clear that a person like this needs an appropriate social background in order to survive economically. The employment at a University makes it possible for the scientist or the scientific philosopher to stop focus on what he or she needs to know and focus instead on any problem brought forward in her academic subject. As the peers, the big names that field of research, are the only important persons of reference for a scientist, the scientist does not need to produce any knowledge that is of concrete use for any human individual. That is to say that the scientific way of thinking has its complement in a specific social way of life: Institutions like universities create people who have no problems in their lives and who, after some time, even forget what it means for a person to have a problem. As it is this kind of people who are solving our problems, it seems to be quite understandable why it is often the case that we cannot learn anything from science and academic philosophy. Scientists are people who are living in a bubble that separates them from everyday reality. Although in the audience there were some people who understood my concerns, there was, of course, no undivided consent to my ideas. The problem here had to do with a further specific inclination of analytic philosophers which is to discuss and solve a problem such as is was posed. I had left this ‘convention of discussion’ of analytic philosophers by not trying to solve the Gettier problem but questioning it instead. The question arising here – which, on the other hand might by typical for Continental Philosophy – is whether we are still discussing the Gettier problem if I talk about what the Gettier problem is for me or what I can see in the Gettier problem? More generally expressed, this problem consists in the question whether I, as the other person, or whether I, as a philosopher belonging to a different philosophical tradition, am entitled to collaborate in the definition of the philosophical problem we are discussing, especially in the case that this problem is taken from the history of Analytic philosophy? This problem of how the Gettier problem can or cannot be defined in a discussion between analytic and continental philosophers induced analytic philosophers in the audience to discuss my objections to the Gettier problem as objections to this problem within the analytic tradition of enquiring it. By doing that I am quite sure that they, themselves, lost and that they distracted others from the point that I had made about the Gettier problem and personhood. Instead of that at the end of the discussion following my talk we were evaluating the problem that if one philosopher had made a definition that claimed a necessity for all relevant cases (e.g. for all cases of knowledge) then for a second philosopher it suffices to show just one possible case against that claim in order to invalidate it, and that, for doing this, it is not necessary to take a close look at such counterexamples and study them intensively.